Seitan Worshipper: "DKos' leevank: Wolfowitz girlfriend planned the Iraqi government"
Thanks to Seitan Worshipper for this great Kos find! I sh*t you not. What was that old Lily Tomlin (I think) quote? "I tried to be cynical, but I can't keep up [i.e., with real events]." As if the tangled web of Paul Wolfowitz and his girlfriend, Shaha Riza, weren't already sordid enough, now comes word that while he was Deputy Secretary of Defense, the Pentagon ordered Science Applications International Corp., a Pentagon contractor, to enter into a subcontract with Ms. Riza under which she spent approximately a month in the spring of 2003 "studying ways to form a government in Iraq." Melissa Koskovich, a spokeswoman for SAIC, said the contractor "had no role in the selection of the personnel who comprised the Iraq Governance Group under this contract." Defense sources said the Pentagon was reviewing the matter. I'd be fascinated to know who, other than Ms. Riza, constituted the "Iraq Governance Group," and what work product Ms. Riza actually delivered. It's not enough that Wolfowitz had a major role in leading this country into an unnecessary war that I think may well turn out to be the most serious foreign policy blunder in this country's history. No, he couldn't leave bad enough alone, but had to get his girlfriend a job planning the most screwed-up occupation and transfer to a new government in perhaps the entire history of military occupations. 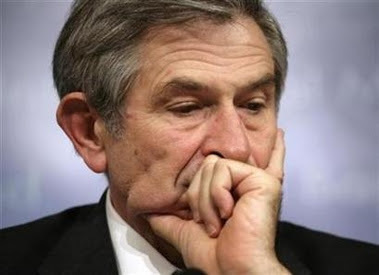 I've got a suggestion for Mr. Wolfowitz: After you get fired by the World Bank, why don't you and your honey move to Baghdad and form your little love nest somewhere outside the Green Zone, where you can have lots of togetherness while living in the middle of the great success that you've created? Maybe the Iraqis will be so impressed by this great love affair between a Jewish man and an Arab Muslim woman that they'll realize the foolishness of their silly sectarian quarrels, and Iraq will become the shining beacon of tolerance and democracy that you told us it would be. Of course, things might not turn out that way, but since you're willing to take big risks with other people's lives, I'm sure you won't hesitate to take some risks with your own.